The RCW are single-output, industrial grade switchers from Kepco. Available in 3 sizes, 350, 750 and 1500 watts, these models incorporate advanced power factor-corrected wide range input technology. 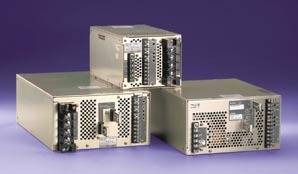 In the 350-1500W models, an EMI filter is built in to ensure that the conducted EMI meets the FCC Class A limit. RCW Models are obsolete. Availability is limited to factory stock, however modern replacements are also available. Construction conforms to EN 60950 (TÜV) as well as UL 1950 and CSA C22.2 No. 234, level 5. The power factor correction circuit ensures that current is drawn over the entire mains cycle to meet the harmonic current limit of EN 60555-2 and EN 61000-3-2. Note: RCW models are form and fit interchangeable with RAX models in the 350W and 1500W sizes. RCW are rugged, single-output power modules that can be individually installed or may be combined into a custom power assembly for multi-output requirements. RCW are also DIN rail mountable. Factory installation for RCW 350W Series DIN Rail mounting is now UL508 Listed (cULus) as Miscellaneous Apparatus: Open Frame Type for use in Industrial Control Equipment. RCW models can be mixed with your choice of Kepco modular power supplies (e.g., RKW open frame, RKW programmable, RTW, RKE, JBW, HSM, RCW) and packaged in one of our standard rack adapters for a custom power solution you design yourself. Or, if you chose, give us your specs and we'll design it for you. RCW are CE Marked per the Low Voltage Directive (LVD), EN60950.